Holders Chile have been drawn in the same group as Argentina, Bolivia and Panama at the 2016 Copa America. Chile beat Argentina on penalties last year to win a first major trophy. The 100th anniversary of football's oldest international championship sees hosts USA drawn with Colombia, Costa Rica and Paraguay. Uruguay, the tournament's most successful team, play Jamaica, Mexico and Venezuela, while 2007 winners Brazil face Ecuador, Haiti and Peru. 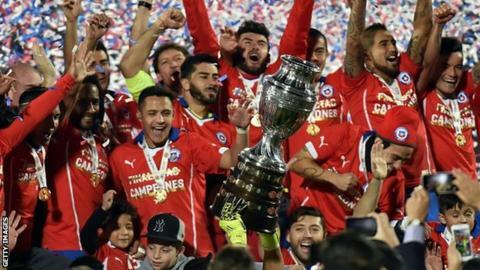 The 2016 Copa America has been expanded by four teams and is being staged outside the South American Football Confederation for the first time. The tournament starts on 3 June when USA play Colombia in Santa Clara, California. The final is on 26 June at MetLife Stadium in East Rutherford, New Jersey. Shearer: Why is Pellegrini 'moaning'?